Hi... veeeeeery new to this forum. I had several Engine Light Codes...from O2 sensors to EGR Valve. Cleared them all accept one. I'm still stuck with a P0038 code. Brand new 02 Sensors Bank 1 sensors 1 and 2. However sensor 2 (downstream) wont go away. had a shop do what I think is a very shabby job. Originally had them pull the O2 sensor and they tack welded it into the pipe saying the threads were stripped. Went back and had them replace the O2 sensor again, this time they had to cut it out. My concern is (and I know I kinda went long to say this) that they replaced the section with the downstream O2 sensor with a much smaller in diameter part that holds the sensor instead of finding a piece of pipe that was similar size as the original. Like I said...every code cleared except that one. Autozone was like wait 2 weeks.... After disconnecting my battery to reset the codes as well as I drive 60 expressway miles a day to and from work and a minimum of 3 cold starts a day, that should be more then enough to clear that code in a week just as all the others did including the P0032 Bank 1, Sensor 1 code. I think the reduced pipe directly behind the Cat with that O2 sensor could be affecting the output... Any suggestions or anyone experienced something similar? Guess I should have mentioned that my Truck is an 07 Chrysler Aspen 5.7 V8 Hemi. Yeah...I'm truely a newbie!! if they used an off brand like BOSCH that's a big issue. found this out the hard way.. used aftermarket O2's on a Town and Country and never could keep the code from coming on... got the OEM and code went away and didn't come on... guess they are just that sensitive.. 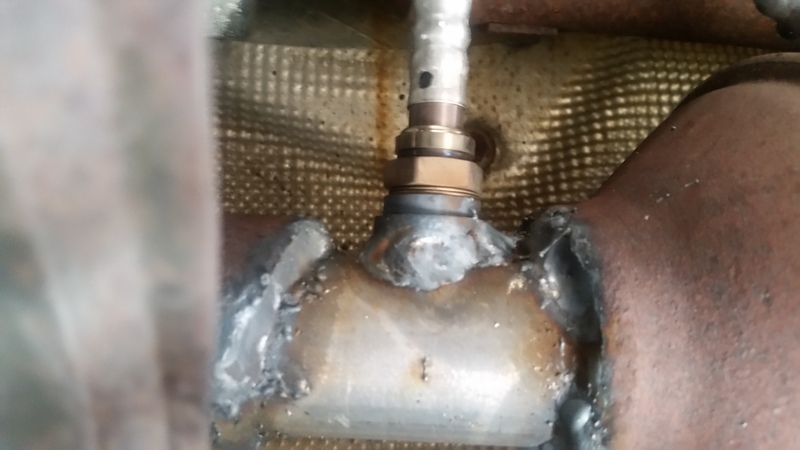 Here is an image of the chop job that they did to correct the fact that they tack welded the dam O2 sensor into the pipe instead of getting a bong hole (know I said this wrong) from Autozone or somewhere and tack welding that in then putting the O2 sensor in since the threads were no good anymore on the original pipe. The O2 sensors are the Bosch brand. The upstream works fine but the downstream doesn't. I plan on making they correct this chop job with an pipe thats similar size, then I'm going to go get an OEM sensor for the downstream as you guys have suggested.